Affecting an estimated 1 in 88 U.S. children, autism spectrum disorder (ASD) is a complicated and diverse group of developmental brain disorders that interfere with language, normal communication, and social interaction. Unlike some other conditions that are caused by mutations in a single gene, as many as 1,000 genes, as well as various environmental factors, are suspected to contribute to the risk of developing ASD. That’s daunting because before we can develop broadly-applicable treatments, we need to figure out which are the key genes, what brain cells they control, and when they are active. NIH-funded researchers at the University of California, San Francisco, Yale School of Medicine, Carnegie Mellon University, and the University of Pittsburgh have taken a significant step in that direction. When they sifted through protein-coding part of the genetic blueprints of more than 1000 families that had one child with ASD, the researchers discovered among the children with ASD, 144 rare, non-inherited mutations that deactivated various genes. Of these, nine genes harbored several different mutations, suggesting they had the strongest causal links to ASD . Because the nine genes didn’t fall into a single category and it wasn’t clear what connected them all, the researchers turned to a digital atlas called BrainSpan . Created by an NIH-supported consortium a couple of years ago, BrainSpan is a valuable resource for all neuroscientists because it catalogs gene activity in 16 regions of the brain during 15 stages of human development—from embryos to the elderly. To the researchers’ surprise, their BrainSpan search showed that in healthy brains, the nine genes implicated in ASD produce proteins that act together during one specific period of time in one certain type of cell in one particular region of the brain. Specifically, this network of genes is active during early and mid-fetal development (10–24 weeks) in glutamate-producing projection neurons in the prefrontal and primary motor-somatosensory cortex—an area of the brain critical for personality expression, social behavior, and language. These findings suggest that when any of these nine genes are misspelled, the consequence is disrupted development of the cortical projection neurons, which function rather like interstate highways connecting the two halves of the cortex and linking the cortex to other key areas of the brain. At the same time, using a different approach, another NIH-funded team at the University of California, Los Angeles, recently found that networks of ASD genes were active in the cortical projection neurons during early development . Taken together, these studies underscore the importance of this cell type and brain region in ASD. It must be emphasized that the new gene discoveries point to just one of what is likely to be many possible routes to increased risk of ASD. Only about 15% of children with ASD have been found to have non-inherited mutations in these genes, and the remaining 85% must have other causes. Still, this work is exciting because it helps to clarify the biological mechanisms underlying ASD, provides a more uniform picture of the mechanism, and gives all who are working to develop treatments and cures yet another important piece in what’s almost certain to be a very challenging puzzle. 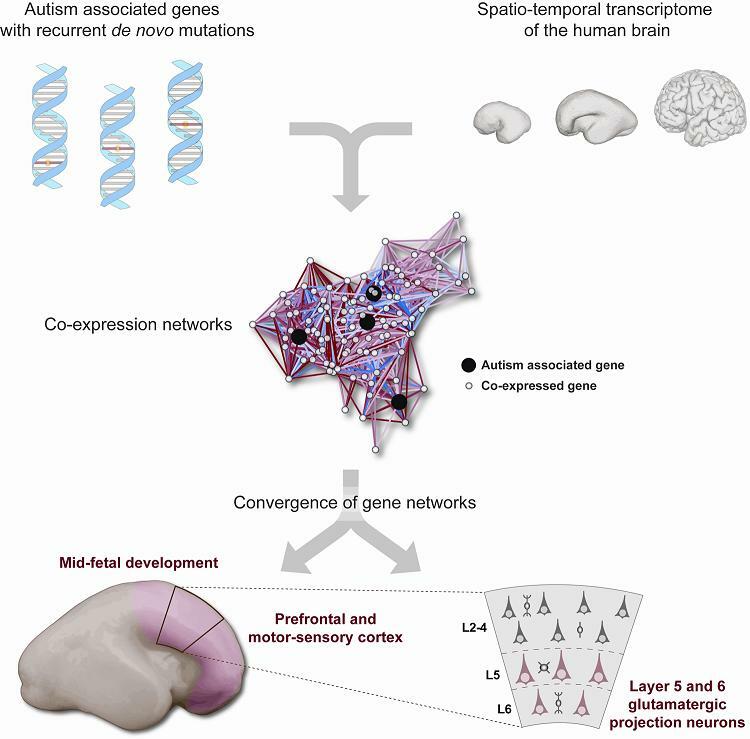 Coexpression networks implicate human midfetal deep cortical projection neurons in the pathogenesis of autism. Willsey AJ, Sanders SJ, Li M, Dong S, Tebbenkamp AT, Muhle RA, Reilly SK, Lin L, Fertuzinhos S, Miller JA, Murtha MT, Bichsel C, Niu W, Cotney J, Ercan-Sencicek AG, Gockley J, Gupta AR, Han W, He X, Hoffman EJ, Klei L, Lei J, Liu W, Liu L, Lu C, Xu X, Zhu Y, Mane SM, Lein ES, Wei L, Noonan JP, Roeder K, Devlin B, Sestan N, State MW. Cell. 2013 Nov 21;155(5):997-1007. Spatio-temporal transcriptome of the human brain. Kang HJ, Kawasawa YI, Cheng F, Zhu Y, Xu X, Li M, Sousa AM, Pletikos M, Meyer KA, Sedmak G, Guennel T, Shin Y, Johnson MB, Krsnik Z, Mayer S, Fertuzinhos S, Umlauf S, Lisgo SN, Vortmeyer A, Weinberger DR, Mane S, Hyde TM, Huttner A, Reimers M, Kleinman JE, Sestan N. Nature. 2011 Oct 26;478(7370):483-9. Integrative functional genomic analyses implicate specific molecular pathways and circuits in autism. Parikshak NN, Luo R, Zhang A, Won H, Lowe JK, Chandran V, Horvath S, Geschwind DH. Cell. 2013 Nov 21;155(5):1008-21. Thank you for the posting. I have observed macro level sensory processing issues that are problematic for young people to cope with. It could be that some of these are also present during fetal development, although it seems unlikely to occur during typical fetal development, that is before 7 months when senses are available. I’m offended in the language you use in the article “Network News: Gene Discoveries for Autism” in that the article uses terms such as “healthy” to describe neurotypicals. Please start using language that doesn’t convey that people with autism are not healthy. Who are you to say what is healthy or not? Hi, Karen! 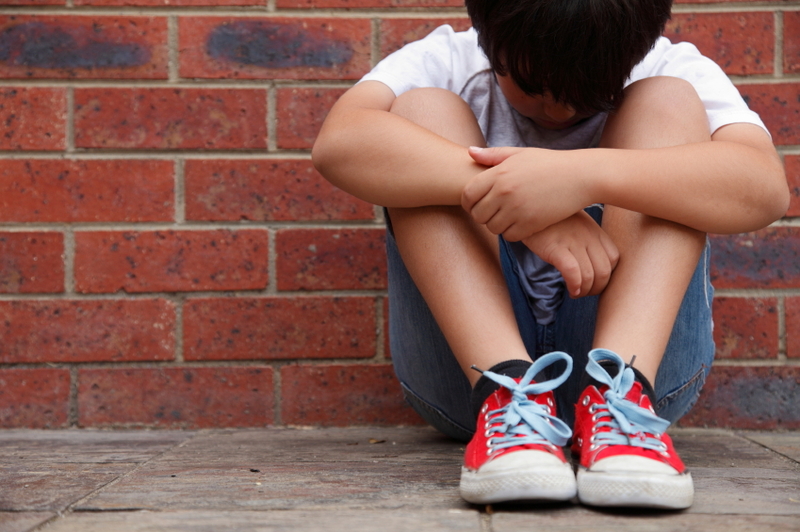 The study featured in this post was done on families with only one child diagnosed with ASD. That’s because the researchers wanted to look for gene mutations that appear to have arisen spontaneously–mutations that children did not inherit from their parents. You are quite right, Malaine. What society has to do is come to terms with autism and ways to help each person develop the gifts they are given. We do not fit molds. Each one of us is needed, just the way we are, for something very special. you are quite right, malaine. We do not all fit the same mold. Each one of us is unique. What we have to learn, as a society, is to help each one find the special gift they have been given to contribute. @malaine Your comment that there is no such thing as “normal” brain development is spot on, and I very much agree that people ought to be switching to the term neurotypical. However, I think here, “healthy” was used here to refer to the fact that the brains were screened for major genetic mutations (that could have caused spontaneous abortions in the fetuses) or neurodegenerative diseases (such as Alzheimer’s). The post does not seem to claim that autistic individuals are not healthy? @Moderator @Karen I would add that the first study focuses on non-inherited mutations seen in 5-15% of individuals with ASD and finds that a small fraction of these (maybe 2% of the overall population?) are affecting a similar time period and brain region. The second study referred to in this post does look at the effect of inherited mutations and discusses Fragile X, too. Even given such mutations, they are mostly thought to increase “risk” – there may be a role for environment in those people and in the other 85% of people with ASD.